There are times when situations demand for split-second target acquisition and maximum field of view. When it comes to such kinds of scenarios, what is the best accessory that you need to enhance your shooting and targeting ability? True it is that the best CQB optic should be the one that you need to look out for in the first place. To help you simplify your search task, we have gathered many of the top-rated CBQ optics in the market and made this far to feature only three products in this review. These products are indeed the buzz-makers and are truly recognized by many firearm enthusiasts today. Vortex Optics StrikeFire 2 Red/Green Dot Sight. This product comes with an imported quality with a 12-hour auto-shutdown that maximizes battery life. It comes with O-ring seals that prevent moisture, non-critical eye relief for rapid targeting and a rugged construction that withstands impact and recoil. Trinity 1-4×28 CQB Optic with Backup Dot Sight. This optic comes with illuminated reticle and ginger adjustable turrets. It also includes a compact red dot backup aiming sight and a rugged bolt-on ring mount. Aimpoint M4s 2 Minute of Angle QRP2 CompM4 Sight. This is simply part of AimPoint’s high-end series with improved energy efficiency. Unlike the first option, this optic comes with a unique coating on its front lens that reflects dot’s selected frequency of red light at near 100% efficiency. 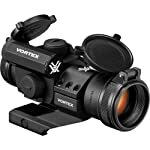 Vortex Optics StrikeFire 2 Red/Green Dot Sight. This happens to be a good choice since its price is at the middle when compared to the price of our other two options. Priced at less than two hundred bucks, this is an excellent pick for your targeting and shooting activities. Trinity 1-4×28 CQB Optic with Backup Dot Sight. Want something more than just an optic? Compared to our other two options, this optic comes with additional accessories such as a compact red dot backup aiming sight, a rugged bolt-on ring mount, and a compact height quick deploy tactical rifle bipod. For a price that’s just below one hundred and fifty bucks, this optic proves to be a great option especially for those who have a tight budget. Aimpoint M4s 2 Minute of Angle QRP2 CompM4 Sight. This is a part of AimPoint’s high-end series and is the most expensive on our list. It comes with additional sight features and improved energy efficiency. It comes with integral and customizable mounts and unique coating on its front lens. The price is not an issue considering all the abounding features and fine characteristics it offers. So, how durable is the optic you are looking at? Don’t be deceived. Many products today look sturdy but once they are used, they tend to break easily. If this is something that you don’t want to happen to you then it is a good idea to have a careful look about the durability of the optic you are eying on. 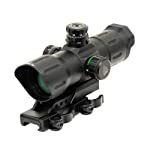 Vortex Optics StrikeFire 2 Red/Green Dot Sight. This product is inspired with its rugged construction, making it as an excellent choice as far as durability is concerned. This means that this optic can strike anywhere and everywhere no matter how challenging the situations are. Trinity 1-4×28 CQB Optic with Backup Dot Sight. Unlike the first option we have, this product has features like fogproof and shockproof and these are important things that you need to take note when opting to buy the best CQB optic. Aimpoint M4s 2 Minute of Angle QRP2 CompM4 Sight. The housing material of this product is made from extruded high strength aluminum and a surface finish that’s composed of hard anodized material. Lens cover is made of rubber. Basically, this product is definitely high-end so you can expect a high sense of durability and longevity from it. After dealing with the quality, price and durability of a particular accessory like a scope or a goose call, the nest thing that you need to consider is its performance. This is what you are going to learn about on this section wherein we will be dealing with the performance of each of the options we have on this list. Vortex Optics StrikeFire 2 Red/Green Dot Sight. this product comes with a 12-hour shutdown feature that maximizes battery life, an O-ring that prevent moisture, dust and debris from getting in, non-critical eye relief for rapid target acquisition and a rugged construction that allows you to make use of it anyway you want to. Trinity 1-4×28 CQB Optic with Backup Dot Sight. This optic’s reticle is not battery-dependent but it comes with brightness adjustment settings. It’s non-magnified as its intended for fast target acquisition. Compared to the first option, this optic proves to be a bit inferior. Aimpoint M4s 2 Minute of Angle QRP2 CompM4 Sight. Compared to the first two options, this product is teeming with many features that spell out not only its overall quality and durability but its performance as well. It can stand 80,000 hours and is designed for all-generation night vision devices. Vortex Optics StrikeFire 2 Red/Green Dot Sight. Since it is made with a rugged construction, it is possible to practice and master the varying features and functionalities of this product. Easily allows you to put the optic bore center 40mm above the base to provide lower co-witness with iron sights on flat top AR15 rifles. Trinity 1-4×28 CQB Optic with Backup Dot Sight. Compared to the first option, this product comes with a whole lot of parts and functions that need to be memorized and mastered. Despite these functions and parts, rest assured that you will get used to them over time. Aimpoint M4s 2 Minute of Angle QRP2 CompM4 Sight. This high-end optic may prove to be the best CQB optic for you since it is inspired by a myriad of settings and functionalities that are easy to comprehend and apply. Opting for the best CQB optic is not actually hard and difficult as long as you are aided by a simple and comprehensive review such as this. Evidently, we have come up with a conclusion that among the three options we have here, the Aimpoint M4s 2 Minute of Angle QRP2 CompM4 Sight is the best one for you.